Baseball News: Todd Radon writes that the Shot Heard Round The World didn”šÃ„Ã´t just cost the Dodgers the pennant, it may have postponed a now ubiquitous uni innovation: tv numbers. … Interesting slide show of baseball signs in the New York Times yesterday. Some interesting spellings, too. NFL News: “Only 8.01% of money spent on pink NFL merchandise is actually going towards cancer research,” writes Cork Gaines in an article for Business Insider. ”šÃ„ ¶ Herman Moore and the Detroit Lions are part of a new (and maybe more thoughtful) cancer research fundraising campaign. Moore had a large patch on the jersey he wore for the press conference that, according to The Detroit News, will also appear on the Lions’ practice jerseys. It was too blurry to make out in the clip though. Help, anyone? (video from Rob Siergiej). ”šÃ„ ¶ Jason Tierney pointed out a very cool Broncos ski mask up on ebay. ”šÃ„ ¶ Seems like NFL Primetime forgot to use the Jaguars’ new logo in a recent broadcast (thanks Nathan Anderson). ”šÃ„ ¶ Speaking of the Jags, they’ll be using their teal uniforms this sunday, while the Titans will wear navy jerseys with white pants for the first time in five years. College Football News: In 1923, Nebraska wore blue uniforms at a home game against Oklahoma, “Out of courtesy to the visiting red-and-white-clad Sooners,” (thanks Gil Neumann). ”šÃ„ ¶ Texas A&M running back Trey Williams was wearing a different number for each of his two rushing touchdowns on Saturday. He normally uses number 17 but switches to 3 on kickoffs — looks like he forgot to change back. No pictures, but here’s a video with his touchdowns at 17 and 46 seconds (from Glen Stern). ”šÃ„ ¶ Maker’s mark-free uniforms aren’t just a high school thing — here’s Crown College going with the clean look (from Eric Bangeman). ”šÃ„ ¶ ASU will probably be wearing “traditional” uniforms against UW this weekend. See if you can guess who made them. ”šÃ„ ¶ In a move that’s as timely as it is tasteful, UNC will wear all black for an event they’re calling “Zero Dark Thursday”. ”šÃ„ ¶ Meanwhile, Pinktober marches on, this time with the purdue band getting in on the action (from Marc Burgess). 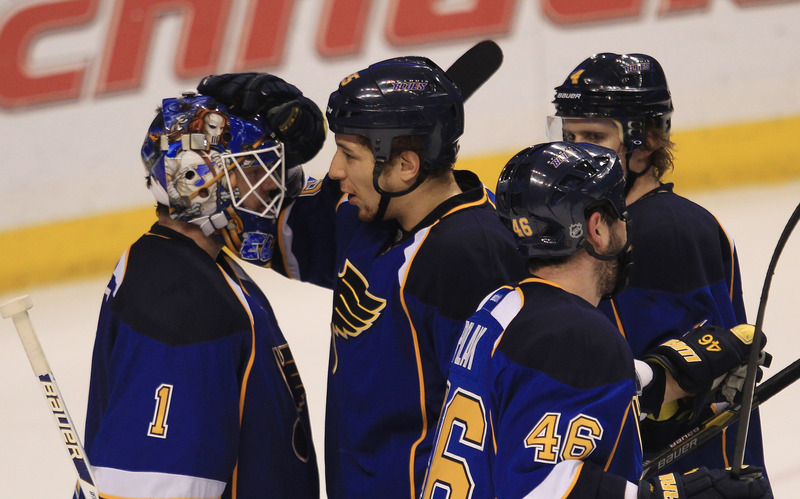 Hockey News: New-look helmet decals for the St. Louis Blues. A bright winged music note instead of a dark bit of text (from Joe Mueller). Soccer News: A photo emerged of Oregon State playing in T-shirts two nights ago (from Vivek Tanna). Grab Bag: City rules in Grand Island, Nebraska make its firefighters about the only people not adding pink to their uniforms this month (from Chris Bisbee).